“The misnamed Rio Plata (silver river) occupies what was once a broad river valley that was drowned by rising seas during the melting at the end of the last ice age. The Spanish colonists hoped to find another Potosi inland, and gave it its name in the hope that tonnes more silver would flow down it to enrich Spain. It is about 290Km long, and starts at the confluence of the Rio Parana/Paraguay delta (that flows over Iguazu falls many miles to the north) and the Rio Uruguay. Its funnel starts two Km wide, opening out to about 220 at the Atlantic coast, making it the world’s widest river (some dispute this, considering it a marine gulf). 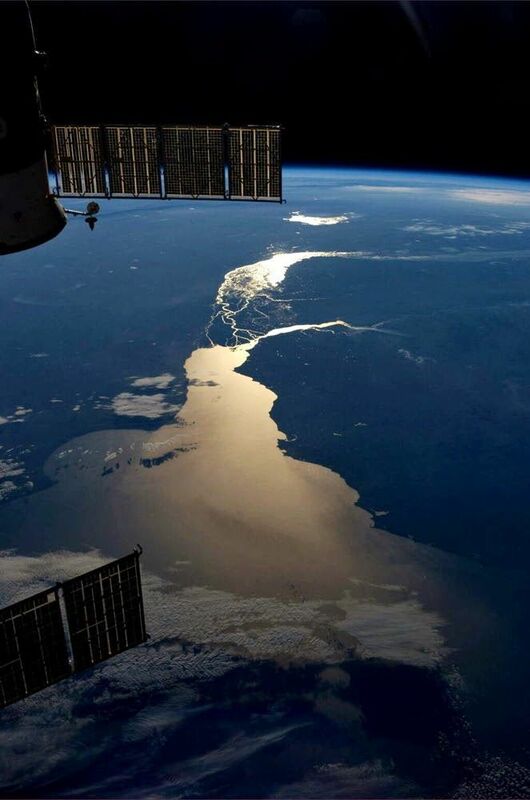 It now forms the border between Argentina and Uruguay, flowing above the Precambrian Rio de la Plata craton, and was the site of a major naval encounter in the last world war. Image credit of the river at sunset: Karen Nyberg. This entry was posted in Science and tagged earth, Karen Nyberg, Rio Plata, science, silver river. Bookmark the permalink.